I, the Autarch, issue these challenges to the gods. The defining characteristic of mortals is that they do, at some point, die. What does this really mean, though? Certainly one whose heart no longer beats, whose chest no longer rises and falls, or whose muscles no longer move or animate him, even though a physical reminder remains, men say that he is dead — that he is gone. Just so, a man who takes a blow in war or misfortune may be rendered deaf, dumb, and in all ways insensate yet still breathe and pass excreta, and men say that he, too, is no longer one of the tribe of the living. Are mortals, then, animation — yet, owing to the contrast of immortals, animation that is at one time but yet is not at another? If this essence of a person goes somewhere else, while the physical component remains, where, then, is that 'somewhere else.' And how are such transposed if they have no physical form to impell them? This challenge does not require DSP, though it will require at least one submission separate from a regular turn submission. The challenge has three phases, each of which can be participated in regardless of previous action or the lack thereof. Phase I: (deadline June 12) Players will publicly submit (in the Trials thread) their model of the afterlife in Acropolis. This can be competetive, collaborative, or a combination of the two, and all submissions may be edited until the deadline. Phase II: (deadline June 15) Players will vote via PM to the Autarch for their preferred version. The Autarch reserves the right to cast a deciding vote and/or edit the chosen version to fit with the overall structure of the game. Phase III: (deadline June 22) Each player will submit a story (via email, like a regular turn submission), detailing their own role in the afterlife (guide or adjudicator of the dead, lord of 'heaven' or 'hell,' etc. ), including how they came to be in this role. In the likely event that two or more players vie for the same role, the Autarch will choose a winner for that role before any others are decided, allowing the others to 're-audition' for other roles. Precedence will be given to players who collaborate in creating a story that defines their separate roles. If at all possible, I suggest you list an alternate in your submission. All actions for this Trial are in mythic time. Whatever model is chosen for the afterlife will go in the rules. Whatever role a player picks up will appear next to their name in the Forum of the Gods. High above the rivers which carry the sediment of the plains, the cliffs are pocketed with caves. Most of these caves offer shelter: shelter to man, beast, lichen. But follow the meandering stream which carries the life giving sediment, and at its source you will find My cavern: t'vilah. A cavern of pulsating sensation, as though the lifeblood of the sediment at the source of the stream pulsed through a dragon-sized heart before coming forth from the earth at the rear of the expanse. The pulsation draws the sediment from the Roots. All is not dark inside. Directly above the stream’s source, an opening reveals the sky above. Sunlight or starlight, both illuminate the natural hall as needed when a visitor comes. The clouds overhead speak of the Crown. The stream meanders out in to plains, invoking the Trunk. All three together in one place. Where the mountains begin, there lies Ristra’s plateau. It rises about a thousand metres above the plain. Its sides aren’t sheer, but steep and treacherous with loose rock and shale – avalanches are common. Safe routes exist to reach the top, but they are not signposted and the bare rock does not reveal the signs of passage. The plateau covers about 15 square miles on top. 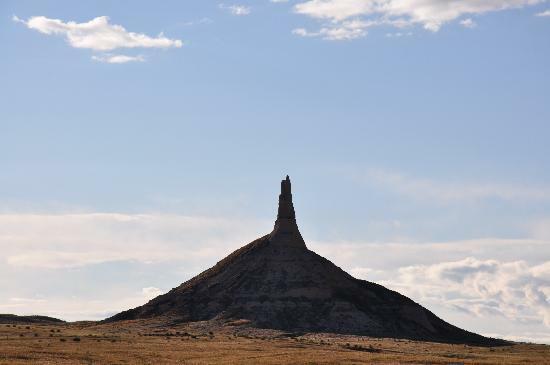 It is by no means flat – it is rugged with many canyons, piles of rock, and the odd cave. Very few plants can survive there – some hardy grasses and woody, twisted shrubs (enough to support a couple of hundred mountain goats). The chili plants are the notable exception, though even those are not what you would call abundant. Towards the back of the plateau stands its one prominent feature – Ristra’s Chimney. A vaguely conical hill rises about 100m above the plateau, and this is topped by a tower of rock a further 50m tall. The Chimney attracts strange weather phenomena. Clouds will often hide parts from view, sinuous mists encircle it regularly, and localized thunderstorms batter it mercilessly. The few residents of the plateau (the Priestess and her retinue) do not live in the area which is normally downwind of the Chimney, as harsh gases and fumes cause all sorts of nasty respiratory problems. If the wind does shift, though, the spiciest chilis can be harvested in this region. The Kochu hold that Ristra’s Chimney mirrors Ristra’s tower in The Roots. It’s certainly true that mortals who climb the hill to approach the Chimney, generally die in horrific fashions. Ristra does appreciate his privacy after all, and he does not ‘do’ guests. Many things were lost in the War. It is said there were once great, terrible weapons, blessed and given power by various gods, which were destroyed or lost. And great wizards once roamed the lands, or taught others, but are now merely legends. Perhaps the greatest loss was Kokoro - the Heart of the Mountain. Perhaps it is still there, deep inside Shen Mountain. Perhaps it was only the cave route by which it was reached that was destroyed. The priests of Shen have long hoped this was the case, and have long explored the caves of the mountain. Caves that were there since before the war, but were altered during the quakes that accompanied the War; and caves that were opened by those same quakes. Another route may be found that leads to Kokoro. Such a thing would be a miracle, for it is said Kokoro was the place where Shen and mortals met. It is said one could actually speak to Shen there! Of course, it was not open to all. If everyone wishing to speak to a god was able to enter Kokoro, Shen would spend every moment of every day in idle, inane conversation. Only a select number of His priests knew the route through the seemingly endless caves. Anyone they deemed worthy was blindfolded and taken in. They said it seemed they were walking, crawling, and climbing ladders for hours, and it was quite impossible to keep track of the route. Surely, there must have been many who attempted to find their way in. But none ever did. It was generally assumed that the priests would stop anyone who came close. In the steep rocky mountainside among the brush and overlooking the fields is a holy place where the Fusang tread gently. 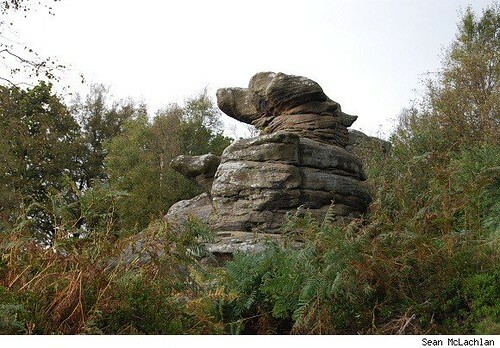 The image of a hound rests in the rocks, gazing over the farmlands and flocks. Some say it is the very image of the god Orlando, himself. It is rumored that at times of great peril when the Fusang are in danger or when the god has been angered, the hound comes to life, frightening to behold. It becomes a savage beast made of rock and leaps into the fields to devour its enemies. It's called the Hound's Dance. "Come along, come along. It's not wise to cross the gorge in ignorance." the Grandfather surveyed the sky as he approached, striding ankle deep in a pebbly stream. Behind him the Grandson absentmindedly Treegazed, holding a cedarbark satchel to his chest. They'd been traveling the entire morning without a break, and he was glad for the rest. 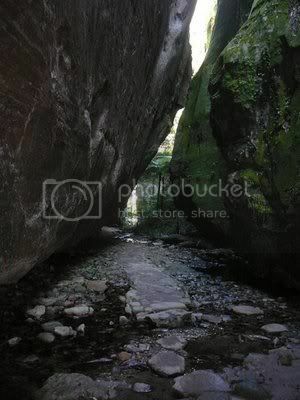 Before the pair, cool stream water ran over their feet towards a dark and jagged mouth...the gorge. Two rock walls towered on either side, covered in neon green lichen and ferns. Whole areas of the stone were nothing but dripping water and life. Steep angling caused the stream beds to merge at the gorge, which ran for a hundred paces in near darkness. The boy thought his Grandfather was just superstitious...he hadn't been afraid of dark places for many summers. After his long appraisal, the Grandfather motioned to the boy to follow him into the gorge. The place where the walls met was very tight. Both were nearly squatting to move, and the motion was uncomfortable and very tiring. The Grandson tightly held the cedarbark satchel, afraid to drop the bundle, and ruin his chances. Before long, the Grandson began to notice something strange. The sensation was difficult to describe, even to himself. It was like being stared at, and at the same time, a sense of thinness. The water echoed off the rock faces in a hypnotizing melody, adding to a lightness in his head. Colors were starting to vibrate into focus and his legs were cramping as the Grandson finally emerged into the light. Pain dissolved before the incredible beauty of the pool. Gorge ended as the two walls opened sharply and curved outward forming a round enclosure, filled with a deep pool of crystal clear water. The rock walls still towered over the pair, making for a perfectly hidden paradise. Birds called from nests made in trees growing from the walls, dipping towards the water. Ferns were everywhere, running along the waters edge, and framing the entire scene in bright green. A small island was centered in the lake, dominated by a massive oldgrowth stump. Split from top to bottom, the stump was blackened and lightning-scarred. On the waters edge was a cedar canoe, polished and smooth from centuries of use. The Grandfather stepped into the canoe, giving a hand to his Grandson as the boy settled in the boat, cedarbark package held between his knees. The Grandfather shoved off, and swiftly made his way to the island. The water, the plants and the high rock walls all created an odd effect, shrinking the space to the human eye. As the Grandson drifted with the motion of the canoe, the feeling from the gorge returned. Gazing at the black tree it's true size astounded him. In fact the stump was only a sliver of remains. Most of the tree had been consumed by fire, incinerated; leaving behind only part of the trunk and an arching root system. Thinness returned to the boy as he lay in the canoe, looking at the stump. The feeling intensified as the canoe bit into sand, stopping suddenly. The Grandson sat up and hopped out of the canoe, dragging it up the shore with his Grandfather, still holding the cedarbark package to his chest. The island smelled, radiating outward from the stump. It reeked of charcoal and cedarblood, and made the Grandson's head spin. The smell, combined with the thinness was having a deep effect on the boy. The Grandfather took his child by the elbow, and moved with him into the center of the stump, disappearing from view. 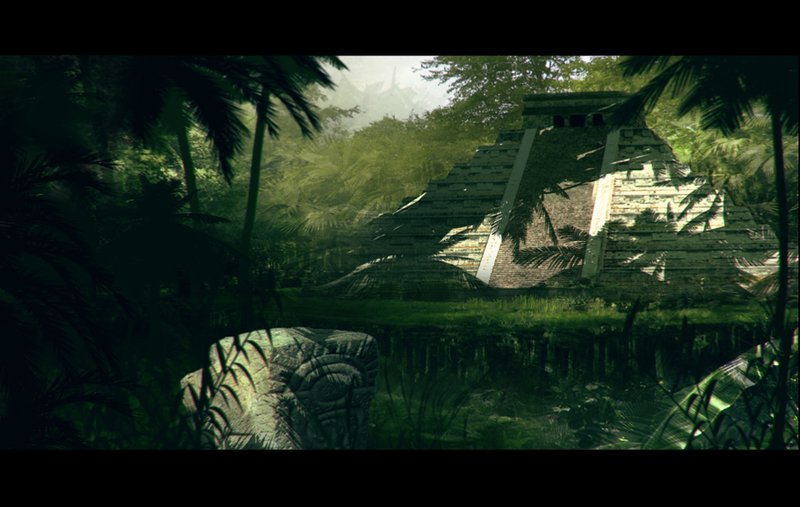 Deep in the jungle, unguarded except by the jungle itself, is the Great Temple of Nyx. Rising high above the ground, the top of this great stone pyramid is nonetheless below the canopy of the even greater trees who guard it. The stones of the temple are old, and worn. The jungle has eaten away at the temple for thousands of years, clearly; the once-sharp corners are now soft and rounded. Nobody lives here anymore. In fact, except for the temple itself, there's no sign that anybody ever lived here to begin with. Atop the mountain of rock is a shelter of some kind, free of any human objects. Within the center of the room is a huge stone block, once flat and sharp, now rounded with time. The rest of the structure seems to be solid stone. Or, at least, nobody has found any other chambers aside from the open room at the apex. Before an Amazon girl is ready to become a woman, she must prove herself to her teachers. She must be able to hunt the animals, and wage war against evil men. If her teachers think she is ready, they will send her to the temple. Many days journey through the jungles she will travel, with only her wits and her skills to sustain her. When she arrives, if she arrives, she must climb the stone steps and enter the shelter at the top. She must stay until she sees a sign, and then she will descend the steps again. When she returns to her village, if she returns to her village, she will be a woman. She will be free to roam the jungles as she pleases, to choose a worthy man, mate and raise daughters of her own, to take a lover, and to reap the rewards or pay the consequences of her actions. None of the Amazons will ever discuss the details of what they saw in the room. A very few, when asked obliquely, revealed only that the sign was unmistakable, and personally meaningful. High above the thickly forested pine slopes that the Ardanien call home, pushing free of the green canopy and stretching toward the heavens through which the hawk soared, rises Onekwenhtara, the red mountain, painted at dawn and dusk with the blood of the sun. Here, at the very roof of their world, the holy men of the tribe would travel, in good times and bad, seeking the touch of their Totem, and the wisdom to perceive the world in truth. Here, unbound by the earth and straining toward the sky, rituals may catapult the spirit into the other world, for good or for ill.
What separates day from night, or one time of year from another? If you want to receive credit for an aspect of time (and perhaps some kind of recurring bonus or even something like a domain), explain what role you had in creating a distinguishing characteristic of time. All responses must assume mythic time. Cooperation and/or competition with other players is highly encouraged. I am a Timelord. History is mine. These groups formed layers, and the layers put time to order. They tell what came first, and what followed. These layers can be seen in my body. In the strata of my cliffs, and in the layers one sees when descending into my caves. Fossils tell of specific events, and it can be read when they happened. I recall the past, for it is written in my bones. I am the Keeper of the Past. And so, Orlando, delighted in the rebirth of his maiden, felt joyous again as he knew he would have her by his side for all eternity. Feeling this promise of future happiness and love, Orlando wanted to share his joy with the world. He wanted the world to know rebirth. Thus, he removed the cloak of fur from around his shoulders and covered the earth with this warmest of wolf pelts, thawing the snow from ground. With his warm and moist breath he blew wind across the plains and with his howl, woke the animals from their winter's sleep. And the last, Orlando gave the Dogwood tree its late winter glory, feeding the people until they can enjoy the first harvests of summer. It is this period of time that we know as spring. “Why should I help you? You have been making this awful racket- ruining my concentration, you’ve been chasing these undesirables into my realm. My experiments have suffered. My great work. Do you know what that means? Do you even care? No, you do not understand, you are beyond comprehension, all of you, and that is why I will not assist you in your war. Do you truly understand so little? No, you may not have my creations. They ARE my great work. They are the solution to your insanity, they are not a tool to aid it. They will repopulate this world after your foolish war has cleansed all life from it! “Four hours is not enough! I require its power for at least twelve hours a day! Thus, a deal was struck that enabled the gods to banish evil from the trunk and boughs. It cost Ristra the bulk of his creations, destroyed in the war, but he gained the power of the sun for twelve hours a day to power his experiments. And it created what we now know as night and day, in the realm of the Trunk. Slow-light is a delicate balance of bonds and repulsion that results in a stable form. Larger nodes of slow-light (Galaxies, Stars, Planets, etc...) act as gateways called forges. These bodies have sufficiently contained large amounts of slow-light to be able to draw from Radix. In this way, galaxies produce more star systems, stars give off heat and light, and planets support life. The Tree is a chink in the ring of energy surrounding the forge it exists on, allowing various forms of super-advanced slow-light (Gods[PCs]) to condense. We know that the universe was a singular point of everything at once. Eventually that was broken out into sections, including the ordered sections of time, and for everything to exist in the structure of time, it must have edges of "is" and "not is". This is true also of things existences in other ways "hot" or "not hot" or "there" but "not here". Each of the dimensions must include limits for each of the things that are defined by those dimensions. Life and death are just part of the dimension of living. Some see it as a binary state, you're either alive or you're not alive. Others would argue that it's a continuum, with some things being more alive than others, but also with a state that is the opposite (not merely the absence) of alive. But, these are all simply possible states of being for the various things the Autarch caused to exist. They are all part of this world, and they are attributes of all the things in this world. The Autarch also caused the three levels of the tree to exist, and to exist in different ways. A thing in the trunk's level will act in certain ways. It will be alive, or it will be dead. This is the world of the concrete. But a thing in the branches, well... that is a thing that exists in potentia, or it exists as an attribute of something else existing at the layer of the trunk. And what happens amongst the roots is mostly metaphor. Metaphor is a strange place to be, since it requires imagination, and by extension it requires a psyche (or many psyches) to imagine it. And so, something from the trunk, could die in a very concrete way... it existed at one time, then ceases to exist in the next... which is to say the concrete existence of that thing is gone. However, the minds who remember the thing having existed, or thought it might exist, they keep a sort of ghost of the thing around. And since it's possible for the metaphors of the roots to influence and effect the area of the trunk, or even what happens in the branches, who is to say that the thing (person, whatever) truly died? The priest paused in his ministrations and looked at the warrior. He could hear the fear in the man’s voice. So fearless in battle yet so frightened of the unknown. He began the story he had read so many times. “The Maiden lay dying, her blood running out, the arms of Orlando tightly around her. She felt so safe, so happy. She looked up at the crooked tree towering over her, hanging low as if in grief. She looked into Orlando’s eyes and reached out to touch his coarse fur, clutch his hand. “And then, she was no longer laying on the ground but upright, Orlando’s great strength flowing through her. She looked back and saw her pale body, lifeless and alone on the forest floor. “She saw the crooked tree begin to leaf and flower and the snow begin to thaw. The grass began to grow and she turned away, still holding Orlando’s hand. “They began to walk through the forest and the Maiden felt more alive than ever before. She was strong and warm. She could hear the wind whistling through the wings of the brown owl as it swooped down on it's prey. She could smell the sweet, rotten loam of the earth. She could taste the hot, salty blood of her next kill. “She saw the land, great and beautiful, green and lush, mountains jutting into the blue sky. She crouched down to the river rushing by and as she took a drink, saw that it was full of souls who were clambering up to the muddy banks to join the earth. “With the Great Grey Wolf, Orlando, beside her, she became queen of the pack and mother to the stars. She gave birth to the souls of the Fusang and made a world for the next life. The warrior reached up, as if climbing an invisible mountain. The drums sounded a mournful heartbeat across the clear mountain air, a lament for the loss of the one in Osseo's chest. A memorial filling his place in the circle, a place left otherwise empty in his honour. One by one the tribe had gathered. Babes in their mothers arms and ancients on the arms of their children. Dressed in everyday garb, called from their homes, their labours, their leisure, called one by one with the steady, measured beat of the funeral drums. Gathered now in the circle with the empty place, gathered around the man they knew, who lay draped in a simple blanket in the centre while the drums sounded, more softly now, but faster yet. Now skipping a beat, now beating twice, a faltering beat to mark the life that faltered. And through the empty space in the circle slipped the Shaman. The high priest, the voice of Nakoma, the eyes of Nakoma, clad only in the feathers of the Hawk. Turning gracefully along the inner face of the circle, looking from villager to Osseo to villager as he spun, one by one, sharing his gaze with the dead man in the centre and each villager in turn. Once round the circle to the empty place, dropping to his knees before, but not in, the space where Osseo would have stood. And all around the tribe sat also. And the Shaman spoke. He spoke to Osseo, but for the rest of his tribe. “Once, long ago, in the mythic time, in the dream time, in the time before time, nothing changed, and nothing died. And in that time we sheltered and played and laughed under the wing of Nakoma, and we knew no sadness. But happy as we thought we were, we knew no joy either. Nothing changed, and everything was as it always had been since the start of memory, and always would be, though the sun rose and set a thousand thousand times. But we paid no heed to his warnings. Now that we knew the name for what we sought, we sought it all the more eagerly. 'Give us change Nakoma,' we cried out. And at last, weeping to himself over his foolish children, he agreed. And the sun rose as it had risen a thousand thousand times before. And before long, people started crying out. We felt a pain in their bellies that we had never felt before. And they begged Nakoma, 'Tell us what is this that we feel,' and Nakoma replied that it was hunger. 'Hunger?' We asked. And he said that in order for things to change, time must pass. And as time passed, things were used up. And he taught us that we must eat lest our bodies were used up. And this was a type of change. Fearful now, we begged him, 'Stop things from changing.' But he only shook his head and said that once set in motion, time could not stop. For change was ongoing. It could not end. And change was hard. But we learned. And we found wonder too. The bellies of women swelled, and new people came out, and they changed every day. And new animals appeared, small at first, but changing to become bigger as this “time” passed. And we were amazed. But as it passed, other things changed also. Our faces, our hair, our very bodies themselves changed. And we were amazed. But one morning, the man who had changed the most did not awaken with the rest of the people, but lay cold and stiff where he had slept, and nothing could rouse him. And gathering the abandoned cloak of flesh once worn by Osseo's soul, the tribe carried it to the high peaks, where Nakoma would gather his soul, and the empty shell of his body would feed the other children of the sky. Before The Autarch was given authority to say “what will be,” we all comprised The Supreme Forces That Were One Mind. And those Forces still comprise Us, and more. All there is. All there was. All there will ever be. Beyond the World. Beyond the Tree. Beyond this Universe. The Forces send us out on journeys through existence and time, gaining experiences and lessons. We manifest in different forms, on different worlds, in different realms. We live. We learn. We love. We experience. We Grow like the Dragonfly. Shifting from Nymph, through Chrysalis, to Transformed with each new manifestation. When we experience all this manifestation can teach us, we leave this realm and return to The Supreme Forces that Are One Mind, melding back in to that Source to share all we have absorbed and experienced. Everyone and everything returns to the Source; regardless of belief, morality, or even sentience. Since The Forces still comprise us, this means we never leave those we love. While they may not be aware of our presence, we support and sustain them as part of The Source of All. There is no cause for sorrow when a loved one departs this realm. They are, and will always be, within us. As we all are for each other. Once we meld back in to The Source and share all we have experienced, We remain The Source until the time comes to venture out and experience new things. How it is determined where and what we shall manifest as remains a mystery, even to this day. But it is never the same twice. …a new journey then begins. When the Autarch was first given the Power of Approval, he made many mistakes. One of the biggest was Death. Death was not an intended allowance. He allowed Time, which was good. But he did not know that Death would creep in as well, allowed but unintended. He was not happy. What fate awaited the part of Mortals that survived Death? The Autarch allowed the Mortals to decide that for themselves. While they were still alive, they could choose the path their Deathless self would follow. Released now by the memories of his tribe, Osseo, but recently bereft of all that he once knew, left behind his sky burial, rising gently and unafraid through the lower boughs of the linchpin of the sacred world. Parallel to the Trunk, the warm wind at his back pushing softly, floating ever higher on the thermals in the wake of a lonely Hawk, beneath silver moons and brilliant suns, across the trackless sky, rising ever higher into the Crown. Perspective changes...no longer rising, but falling. When before he known he looked up into the Crown, now suddenly he looked down on it. Slowly falling. Gently falling, but falling nonetheless toward the green not-sky, now below. And rising from the green here and there the peaks of mountains unseen from the world left behind, mountains that cannot sit in the canopy, that cannot be rising through it from below, which are. Mountain peaks shot through with green valleys, with clear streams, with pine clearings where mist lingered before the sun burned it away. And falling beside him now, shadowing his descent, wings motionless in the bright mountain air, Nakoma, patron, elder spirit, sacred to the Ardanien, silent and far huger than any mortal Hawk, a silent presence welcoming his own in some barely perceived way. Perspective changes...no transition...standing on a ground that exists only in the mind of Nakoma. The forest edge. Another clearing. The Hawk gone into a fathomless sky without a thought and Osseo alone and uncertain for the first time since this journey began. Sunset, the last fingers of light brushing between the pine trees of the clearing left behind, and Osseo walking into the quickly night-dark forest, his imaginary heart striking against his imaginary chest. The sounds of the forest at night unusually strange in this strange place. Now moving, now freezing, on through the dark night, the long night, clumsy as though his life had never been, hesitant and afraid of stalking beasts and nightmares when fear was thought long left behind, Osseo walked. Without expectation...without destination...surrendering himself to the inexorable and inexplicable, he walked. Following the line of least resistance through the dark pine forest in the longest night he had ever known, until at last the thinning forest cleared with a lightening sky and voices through the trees. Voices! Once more fleet of foot and sharp of eye and heartened by the breaking dawn Osseo ran, ran toward the clearing and a host of faces rejoicing in his coming. His people, as they had been since time out of mind, since the time before time, free and unencumbered, joyful and unchanging. Sheltered by the wing of Nakoma. And the dark forest, the primal fear...he learned that for those who were unworthy, the sun never rose.